This Mexican resort hopes you discover vacation nirvana. 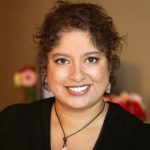 Waheeda Harris is a freelance journalist who writes about travel, design, culture, cuisine, style and the people who are passionate about what they create. At the southern tip of the Baja Peninsula, the sun seems to always shine over Cabo San Lucas, a resort destination popular since the 1980s. The Sea of Cortes beckons holidaymakers to take boat tours to see the famous El Arco and Land’s End and to swim and snorkel the deep waters to see abundant marine life. While on land, there’s numerous souvenir shops, tasty restaurants and the infamous Cabo Wabo Cantina. Paradisus Los Cabos is a haven from the numerous distractions of this coastal region and channels the luxe amenities central to the Paradisus Resort lifestyle. The resort’s open-air structure offers a multitude of sunny and shady spots to appreciate the native gardens of oversized cactus and tropical plants and the sweeping expanse of the crescent-shaped white sand beach and blue sea. A member of the Leadings Hotels of the World, this 350-room resort can easily entertain fussy toddlers and charm serenity-seeking adults, providing a memorable taste of Baja hospitality for guests of any age. Less than a half hour from the airport, this laid-back resort is also only 20 minutes from lively Cabo San Lucas, making it easy to experience its entertaining highlights or take a boat tour. Ten minutes in the opposite direction, guests can visit art galleries and artisan shops in tranquil San Jose del Cabo. A multitude of room options (and all-inclusive status) makes this hotel a worthy option for a wide variety of guests. There are 30 Family Concierge suites featuring in-room services such as amenity kits and mini-bar options for kids, a turndown service offering milk and cookies and the Family Concierge Lounge, a space for parents to relax and kids to play. Adults can upgrade to the 98 Royal Service suites, featuring in-room butlers, and exclusive access to a Royal Suite zone, including La Palapa Restaurant and Palapa Bar, a swimming pool and Royal Service Lounge with separate check-in, concierge services, small plate dining and the Royal Service Lounge Bar. 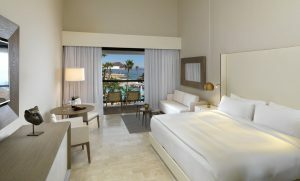 Contemporary simplicity is the mantra for Paradisus rooms. The all-white décor with gray accents is a restful haven and all rooms include a balcony with sea or garden views. With double or king beds, these contemporary spaces have oversized tile floors, blackout drapes, 50” flatscreen television and midcentury influenced furniture, including a seating area with two chairs, circular table, accent tables and for those with a king bed, a modern sofa bed. Spacious closets include robes, slippers and multiple racks and shelves for clothing, shoes, accessories and luggage to be easily stored. 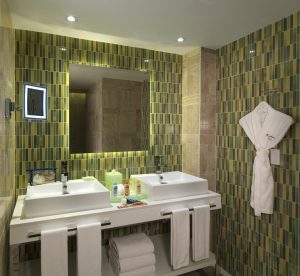 Bathrooms feature walk-in showers and Thierry Mugler bath amenities. All rooms include Nespresso machines for your morning caffeine fix and a daily replenished mini-bar with water, juice, soda and beer, discreetly tucked into a long bureau below the television. Guest rooms open into open-air hallways with lush tropical gardens. Amusements are found everywhere on property for those who don’t want to relax on the numerous lounge chairs clustered around the oversized main pool: beach volleyball, water basketball, water polo, giant chess and beach football. In addition to the 24-hour fitness center and beach access, guests can participate in daily Zumba, yoga and dance classes, as well as workshops to learn how to make sushi, guacamole and cocktails. The Mini-Club is complimentary for kids ages 4-12, with daily activities including treasure hunts, mini-Olympics, arts and crafts activities and face painting. In the evening (or when shade is needed), table tennis, Xbox 1, PlayStation 4 and movie nights are offered, as well as cultural shows, casino night, live music and dancing at the Gabi Club. 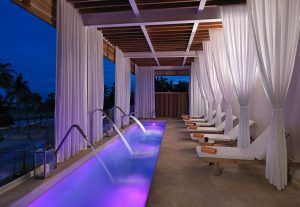 Vacationers needing rejuvenation and restoration can seek out the Yhi Spa, providing hydrotherapy, steam room and sauna with facial or body treatments, and also provides salon services. There are seven restaurants and seven bars on property, providing endless options from 7 a.m. until 11 p.m. to satiate one’s palate and quench a thirst; and 24-hour room service for late night snackers or early morning risers. Naos is an international buffet open for all meals, Gabi Beach is open for al-fresco dining during the day and Terraza & Market Grill has a hybrid combination of buffet and a la carte menu items for lunch and dinner. 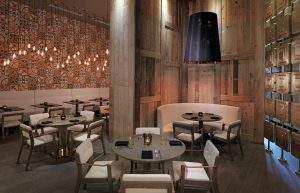 Dinner options also include Bana for Asian-fusion cuisine and Mole for classic Mexican and Spanish fine dining at Gastro Bar by Martin Berasategui. Surrounded by décor inspired by a fashionable library, guests will appreciate the contemporary Basque menu by the Michelin-starred chef, who holds the most Michelin stars of any Spanish chef. Try to reserve one of the 28 swim-up suites, where one can cool off steps from bed without giving up the quiet retreat of the spacious hotel room. Contemporary décor and numerous stylish seating areas allow guests to find many places throughout the hotel to get the coveted most-liked photo for the ‘gram. You can get certainly get in your 10K steps a day thanks to the immense layout of the hotel but the numbering system for floors is very confusing—it would make sense to give floors names rather than numbers. A Junior Suite with Garden View (double occupancy) starts from CAD$373 (US$282) per night. Waheeda was a guest of the hotel during her stay. The hotel had no editorial input for this review.